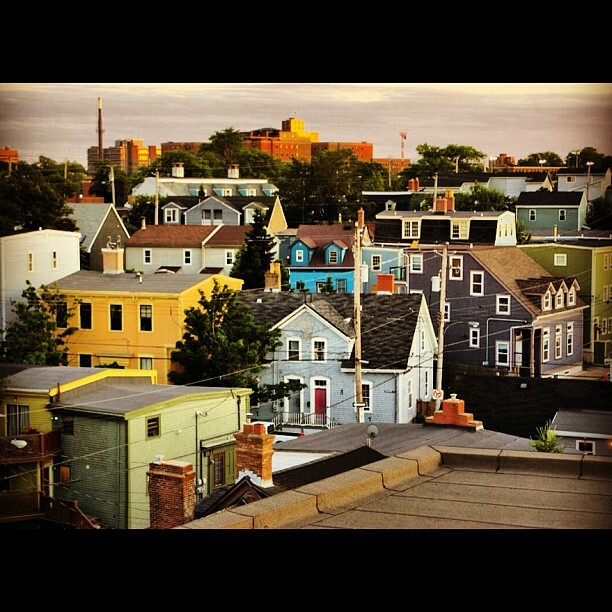 Mccann, L.d.. "Halifax". The Canadian Encyclopedia, 05 March 2019, Historica Canada. https://www.thecanadianencyclopedia.ca/en/article/halifax. Accessed 18 April 2019. Halifax, Nova Scotia, incorporated as a city in 1841, population 403,131 (2016 c), 390,096 (2011 c). Halifax is the capital of Nova Scotia and the largest urban area in Atlantic Canada. On 1 April 1996 Halifax was amalgamated with neighbouring communities to form the Halifax Regional Municipal Government. Halifax Regional Municipality occupies a strategic and central location on the province's east coast and is one of the world's largest harbours. Sometimes called "Warden of the North" for its historic military role, today it is a major regional centre for Atlantic Canada's economy. Human settlement of present day Nova Scotia dates back to the end of the last Ice Age, approximately 13,000 years ago, when groups of hunter gatherers moved into the area to hunt caribou. Oral tradition identifies these early settlers as the forefathers of the Mi’kmaq people, who occupied a territory stretching from the Gaspé Peninsula to Cape Breton Island, called Mi’kma’ki. The Mi’kmaq did not establish permanent settlements, but moved in seasonal rounds from coastal regions in the summer where they fished and hunted, to inland areas in the winter where they hunted game such as moose, caribou, muskrat and bear. One coastal area used by the Mi’kmaq was Jipugtug, later Anglicised as Chebucto, which meant “the biggest harbour.” The Mi’kmaq were prosperous and greatly impressed early Europeans. 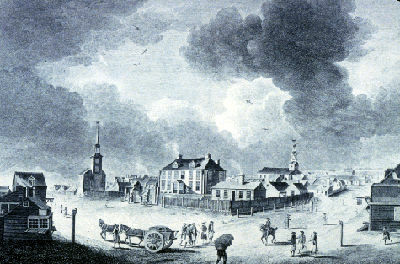 Richard Short's engraving of Halifax shows St Paul's to the right; St Mathew's, the Protestant meeting house, and to the left-centre the official residence of the governor (courtesy Library and Archives Canada/C-2482). Edward Cornwallis, founder of Halifax (courtesy Library and Archives Canada/C-11070). The original Halifax Gazette, Canada's first newspaper (courtesy of the Massachusetts Historical Society). In 1746 the British government sponsored the first settlement plan in North America, focused on present-day Halifax. This settlement was undertaken for a number of reasons, including countering the Catholic presence throughout Acadia	and the French military presence at Louisbourg, but more importantly exploiting the rich cod fishery. In 1749 some 2,500 settlers, mostly poor and recruited mainly from England, arrived, led by Colonel Edward Cornwallis. 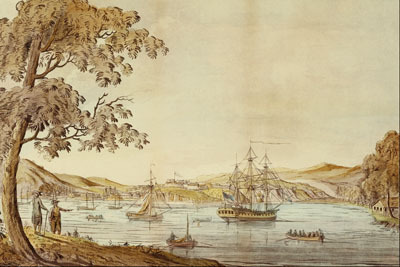 Cornwallis selected Chebucto as the site of the new settlement because of its fine ice-free harbour, the second largest in the world. 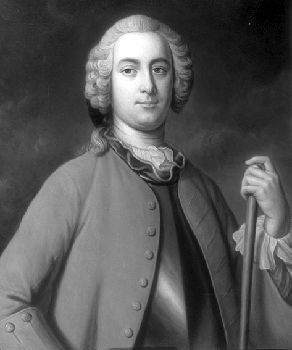 First named Chebucto, it was renamed Halifax shortly after in honour of George Dunk, Earl of Halifax and Chief Lord of Trade and Plantations, who masterminded its settlement. The first settlers had free building lots, but few houses were completed before winter. While some people stayed aboard ship and some others died, almost 1,000 departed for Boston and other US destinations. However, merchants, many trying to escape debt, indenture or hoping to profit from the money being invested in the colony, soon arrived from New England. A governor's residence, an Anglican church, wharves, modest defence facilities and wooden houses were all built within a year. To bolster the settlement’s population, Germans, known as "Foreign Protestants," were recruited and given land just north of the town. Relations between the Mi’kmaq and English were strained. The Mi’kmaq felt that the English had settled on their lands without their permission, and English officials initially refused to adopt the custom of giving presents in exchange for use of the land. Cornwallis wanted to bring the Mi’kmaq under his authority, but they refused. In retaliation Cornwallis set a bounty on Mi’kmaq scalps. The Mi’kmaq in turn declared war on the British in 1749. The French at Louisbourg	encouraged this antagonism, and provided weapons and money for the Mi’kmaq war on the English. The Mi’kmaq attacked British settlements, and conducted a successful raid on Dartmouth in 1751. In August 1755 the British deported the Acadians, descendants of French settlers, who they saw as a potential threat. The deportation of the Acadian population and the British capture of Ile Royale and Ile Saint-Jean effectively ended French influence in the region. The Mi’kmaq were left to oppose the British on their own, and the chiefs signed a peace treaty with British officials in 1761. However, the American Revolution (1775-83) led the British to reinforce its military presence at Halifax and also brought an influx of Loyalist refugees. These factors tipped the balance of power against the Mi’kmaq in the region, who were quickly dispossessed of their remaining lands. Market site in the 19th century (courtesy PANS). Pleasant Street S, looking out at the harbour entrance, Halifax, NS, c. 1884 (courtesy National Archives of Canada/C-008975). 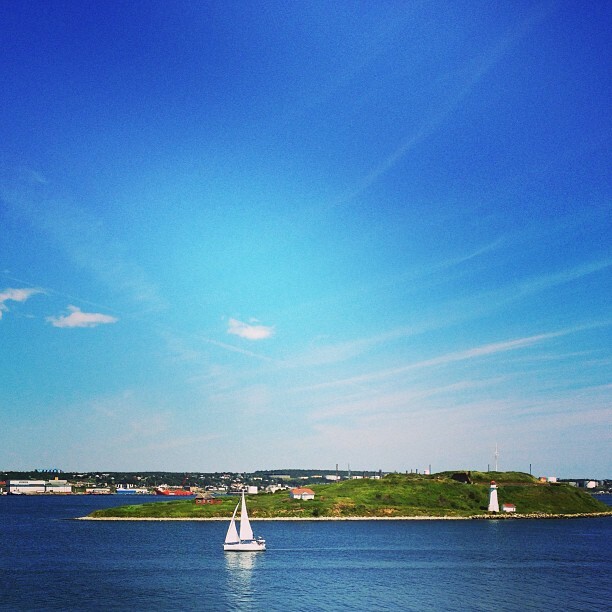 Halifax is on the margin of the Canadian, North American and North Atlantic trading world. 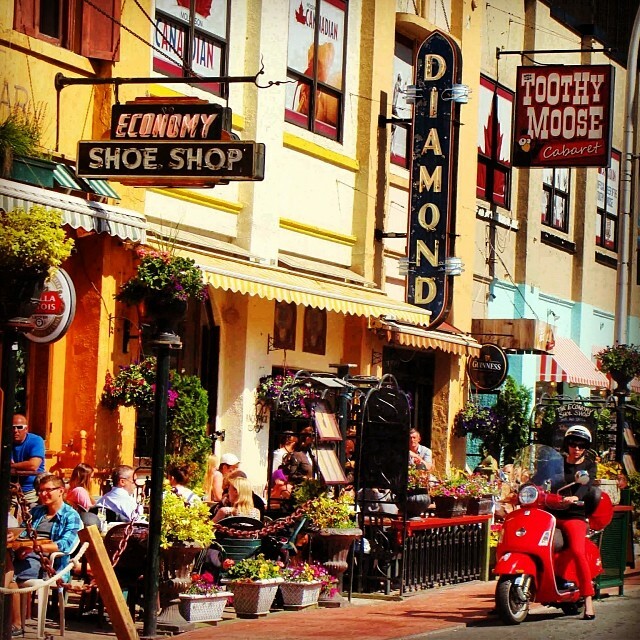 This location led to slower growth than most other large Canadian cities. Until the early 19th century exports of fish and forest staples were comparatively small and trade activity risky. During the Napoleonic Wars (1793-1815) wartime activity buoyed the local economy, as Britain and its Royal Navy needed a safe supply of timber. Thereafter, economic growth based on privateering, international shipping and trade, especially with the Caribbean region, expanded wealth and population, culminating in a "golden age" of prosperity in the mid-1800s. Enos Collins	established the Halifax Banking Company, while Samuel Cunard earned his early fortune in the city. After 1854 the age of sail was surpassed by railway building and the new industrialism of the 1870s, both linking Halifax to the continental economy. 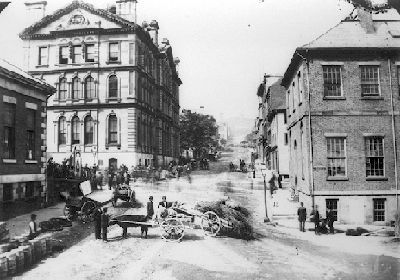 This late-19th-century spurt in Halifax and Dartmouth included the building of a cotton factory, two sugar refineries, and a ropework and railcar plant. However, this prosperity was short-lived. Some of these businesses were destroyed during the Halifax Explosion (1917). Additionally, long distances to markets, lack of local resources and population, and central Canadian competition limited further manufacturing expansion. By the First World War the Bank of Nova Scotia and the Merchants Bank of Halifax, now the Royal Bank, had relocated to Toronto and Montréal. Halifax concentrated on strengthening its rail and water transportation functions, spurred by the large-scale ocean terminals built in 1913 to export prairie grains. Twentieth-century wartime activity (1914-18 and 1940-45) again heightened Halifax's enduring strategic role, as the city became a major port for shipping supplies to Europe. However, the steady development and economic growth since the 1950s stems more from wholesale distribution, transportation, government jobs, university education and specialized institutions like the internationally famous Bedford Institute of Oceanography. This aerial view of Halifax depicts the two bridges to Dartmouth (courtesy Aerocamera Services Inc, Orangeville, Ontario). Early Halifax stretched north and south for several kilometres along the harbour, flanked to the west by the Halifax Citadel and the Common. The city followed a symmetrical plan, with rectangular streets running up the slope from the waterfront. The Naval Dockyard, built in 1759, occupied a site in the North Suburbs, which remains a working-class district. The South Suburbs and large estates on the Northwest Arm were home to the middle and upper classes. Near the Grand Parade St. Paul's Anglican church (1750), Government House (1800), Province House (1818) and other important institutional and residential buildings attest to Halifax's rich Georgian architectural heritage. In Dartmouth, locks of the Shubenacadie Canal and waterfront manufacturing still tell of 19th-century industries. The Public Gardens, formally laid out in 1867, are modelled after northern British examples. Halifax's Point Pleasant Park (1866) was once a military reserve, like Vancouver's Stanley Park. By the 1950s much of peninsular Halifax was built up. As a major railway and shipping centre, docks and rail lines almost encircle the city. 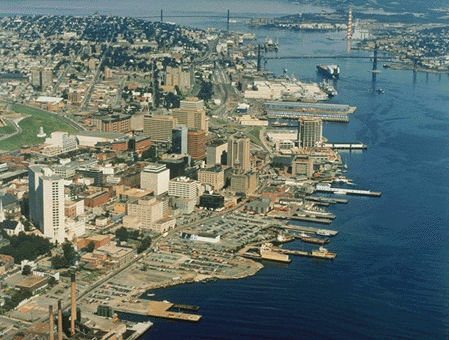 Dartmouth’s importance as a residential area grew rapidly with the spanning of Halifax Harbour by the Angus L. Macdonald (1955) and A. Murray MacKay (1970) bridges. These crossings are heavily used, and a 2008 report predicted that by 2016-2036 a new harbour crossing would be needed to handle increased volume. Bedford and Sackville are suburbs that also accommodate the city’s population growth. The industrial expansion of the city of Halifax had a devastating effect on Africville, an African Nova Scotian community located on the edge of the Bedford basin. The community had been home to black residents of Halifax since the mid-19th century, but was neglected by the city, which provided no water or sewage facilities and put a municipal dump nearby. In 1961 city council voted to remove the residents to make way for industrial development. Many residents protested, and resented not being consulted about the project. The residents were evicted, Africville was demolished, and the land converted into a municipally owned park. The site was recognized as a national historic site in 1996, and continues to serve as a symbol of Black Nova Scotian cultural identity. Central Halifax has been revitalized by extensive commercial redevelopment around the original central square and along the waterfront. The towers of national banks dominate the skyline. Restoration projects include Scotia Square, Historic Properties, the Maritime Museum of the Atlantic, the Art Gallery of Nova Scotia and a courthouse. Dartmouth's historic core has been similarly restored. 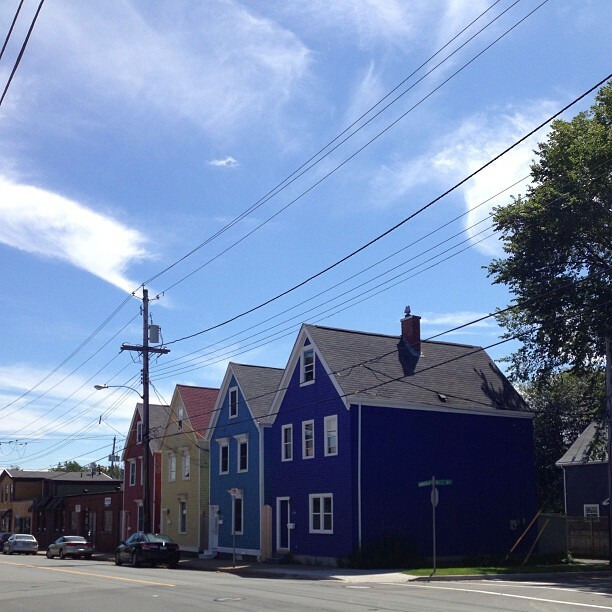 Inner city neighbourhoods in both cities showcase heritage preservation and gentrified houses. The HRMbyDesign process, a public-private partnership, was launched in 2005 and works to promote economic growth in the city while not losing sight of heritage considerations. 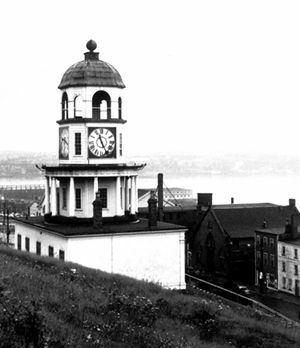 When Halifax was founded in 1749, the majority of residents were from England, Ireland and Scotland. Soon after they were joined by immigrants from Germany and America. Black people, some from Africa, others escaping enslavement in the United States, settled in or near Halifax beginning in the 18th century. The first large group of Black people to settle in Nova Scotia were the Black Loyalists, who had supported the British in the American Revolution. Irish Catholics moved to Halifax from the early to mid-19th century, many escaping the height of the Irish potato famine in the 1840s. Late-19th-century immigration to Canada mostly bypassed Halifax for Ontario and the West. Growth was slow, dependent on natural increase and migrants from rural Nova Scotia. 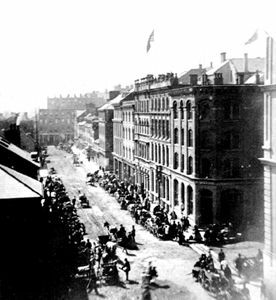 At Confederation in 1867, Halifax was the fourth largest city in Canada, but its position slipped thereafter. Expansion of the city boundaries westward in 1969 boosted the population considerably, and the 1996 amalgamation with neighbouring municipalities also increased the city’s population. Many newcomers to Halifax-Dartmouth come and go as transients; they are employees of the armed forces, national corporations, research institutes and the federal government. According to the 2016 census, people citing Canadian origins make up the largest ethnic group, at 38.4 per cent of the city’s population, followed by English (30.6 per cent) and Scottish (28.5 per cent). Visible minorities account for 11.4 per cent of city residents, with Black, Arab, Chinese and South Asian people comprising the largest communities within this group. 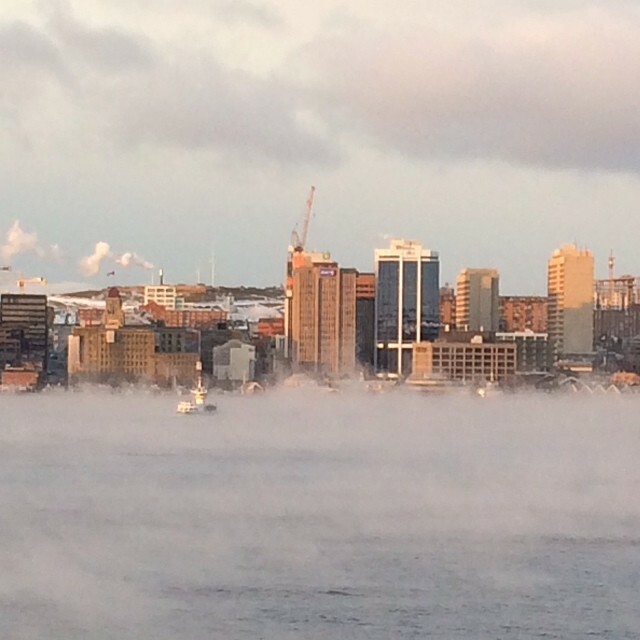 Indigenous peoples make up a further 4 per cent of Halifax’s population. 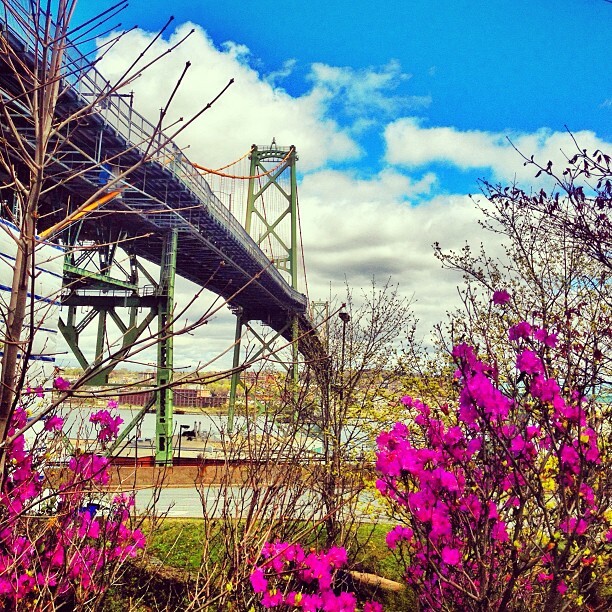 Halifax is a major economic centre, representing over half of Nova Scotia’s economy. The city’s economic growth is comparable to other large Canadian cities outside of Western Canada, and is based on a mix of private and public services, which provide a stable economic base. Trade, health care and social assistance, education, and public administration are major economic sectors, along with accommodation and food services, finance and construction. 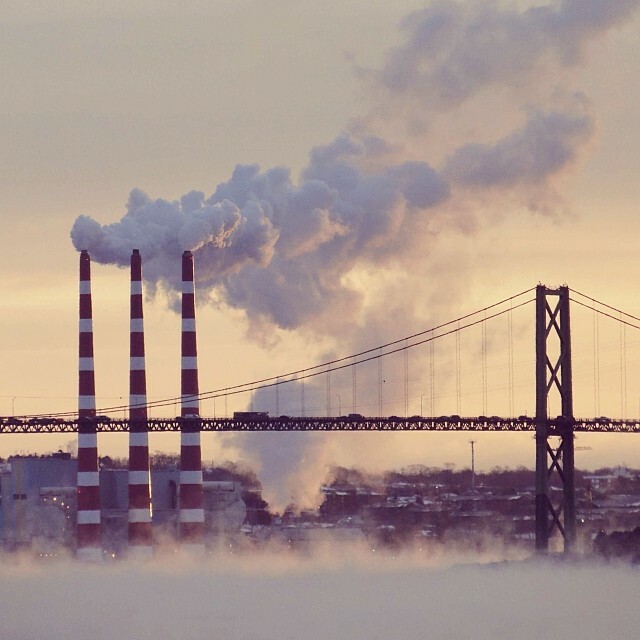 Major employers include Canadian Forces Base Halifax, the Capital District Health Authority, Dalhousie University, and Nova Scotia Power Incorporated. A Royal Canadian Navy shipbuilding project will also create new jobs through 2030. 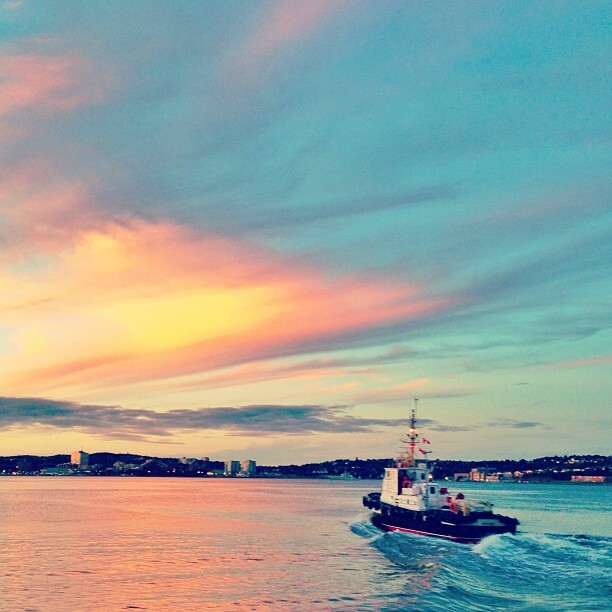 Halifax is the principal port in the Maritimes, handling over 1,500 vessels per year. Halifax’s port infrastructure includes two large container terminals, which are currently being upgraded and expanded. Many containers unloaded at the port travel over the Canadian National Railway's lines. CN is the successor of the Intercolonial Railway, which was briefly headquartered in Halifax in 1872. Rail lines along the southwestern and eastern shores now stand idle, replaced by truck companies which carry products such as fresh fish and lobsters to distant markets. VIA Rail	provides passenger rail service to the city, but follows a reduced schedule. Halifax’s Stanfield International Airport, built in 1960, is the principal full-service airport for Atlantic Canada, with over 3.6 million passengers travelling through it per year. In 2004 the Halifax Gateway Council was established to improve the efficiency and competitiveness of the city’s air, rail, sea and truck transportation. Halifax has a rich literary and printing heritage. 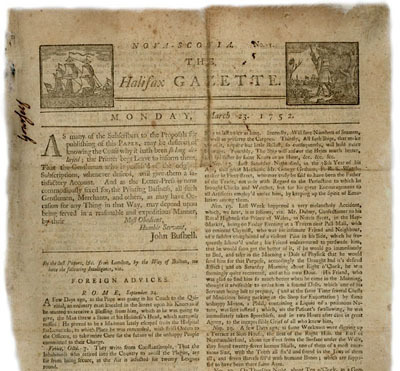 The Halifax Gazette was Canada’s first newspaper, and was first printed in 1752. Another famous historical newspaper is the 19th-century Novascotian, once a forum for Joseph Howe's reform politics. These two newspapers are no longer published, but Halifax is currently served by the daily Chronicle-Herald. In addition to the Gazette, Halifax is home to other firsts, as it also had the first Canadian periodical, the Nova-Scotia Magazine and Comprehensive Review of Literature, Politics, and News, published in 1789. The first bookseller in English Canada, James Rivington, began selling books in Halifax in 1761, and the city was also home to Canada’s first public library, opened in 1864. Halifax is also one of the CBC's	principal regional broadcasting centres, producing national FM music and television news programs, and CTV Atlantic also provides live programs. 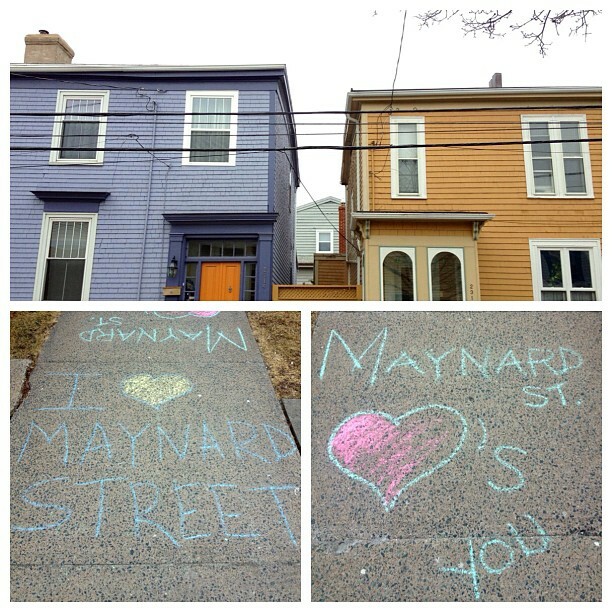 Continuity and accommodation mark Halifax politics, but significant reforms have occurred through the city's history. Canada's first elective assembly was in Halifax in 1758 (see Representative Government). Until it was incorporated as a city in 1841 local affairs were governed by appointed colonial officials, often called a "clique of magistrates." Joseph Howe promoted reform, and after Halifax's incorporation an elected mayor and council of aldermen representing city wards managed the city. This system lasted for over 150 years, until 1 April 1996, when the Halifax Regional Municipal Government was created in an attempt to reduce costs and promote greater efficiency. Halifax, Dartmouth, Bedford and the rest of Halifax County lost their independence, and a mayor and 23 councillors now govern the urban region's metropolitan affairs. In 2008 the province enacted An Act Respecting the Halifax Regional Municipality, also called the Halifax Regional Municipality Charter, which gave the municipality new powers in regard to planning.Partisan politics have played little role in local government, despite significant class and religious divisions. A "dual" school system was introduced in the 1860s because of a substantial Irish Catholic population, and operated Catholic and other "public," or secular, schools. However, the 1969 annexation of suburban districts from the former County of Halifax and school closures in central Halifax ended this system. Similarly, a century-old "gentleman's agreement" of alternating Catholic and Protestant mayors ended in 1955 when Leonard A. Kitz, who was Jewish, was elected mayor of Halifax. The city has had three mayors since the formation of the Halifax Regional Municipality in 1996, all of whom were experienced politicians before taking office. Walter Fitzgerald was the mayor of Halifax when the Halifax Regional Municipality was created in 1996, was elected the first mayor of the new municipality that year, but placed third in his bid for re-election in 2000. After a tight race Peter Kelly, former mayor of Bedford, became the mayor of HRM in 2000, and would remain in office for 12 years. During his tenure he delivered an apology to the people of Africville and championed the cleanup of the harbour, although he faced criticism in 2009 for poor public communication about a sewage treatment plant that broke down. Kelly did not seek reelection in 2012, and former Liberal member of parliament for Dartmouth-Cole Harbour, Mike Savage, was elected in a landslide vote. Halifax is the cultural centre of Nova Scotia. From its founding music, art and the theatre have been central attractions. When it was a garrison town many officers both supported and participated in these activities. The Neptune Theatre, the Nova Scotia College of Art and Design	and Symphony Nova Scotia continue these traditions. The Art Gallery of Nova Scotia’s Halifax location houses the gallery’s permanent collection and hosts a range of exhibitions and programming. Well-known writers associated with the capital are Thomas Chandler Haliburton, Thomas McCulloch, Thomas Raddall and Charles Ritchie. Hugh MacLennan	is another well-known author, and his book, Barometer Rising, details the drama surrounding the Halifax Explosion of 1917 in the city's North End, an event commemorated by the Bell Tower at Fort Needham Memorial Park. Both the Nova Scotia Museum of Natural History and the Maritime Museum of the Atlantic exhibit the historic past, which is also preserved at the Public Archives of Nova Scotia. 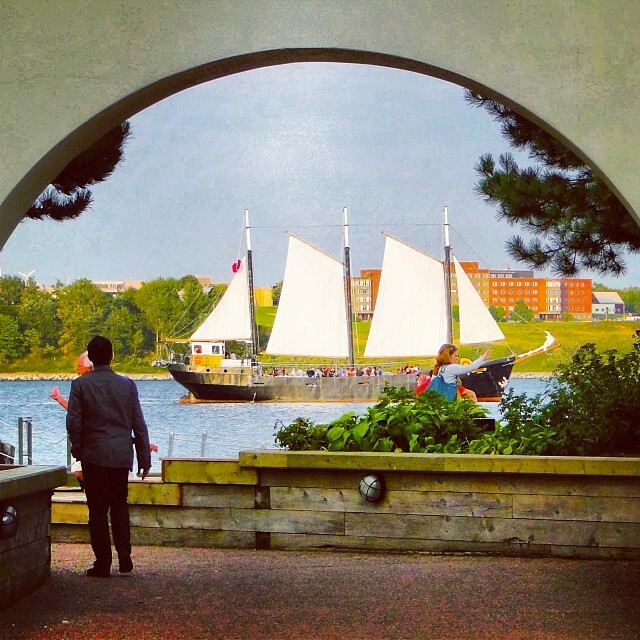 The Halifax Citadel	historic park overlooks the harbour and is a major attraction. Traditions are further upheld by long-established ethnic organizations such as the Royal St. George's Society, The Scots: North British Society (1768) and the Charitable Irish Society (1786). In 1996 Pier 21, a terminal that was the entry point to Canada for over one million immigrants between 1928 and 1971, became a national historic site, and the Canadian Museum of Immigration opened there in 1999. Each October is Mi’kmaq history month. Annual Treaty Day celebrations kicking off the month take place on October 1, the anniversary of the 1986 Supreme Court ruling that confirmed Mi’kmaq rights to hunt, fish, and gather to make a modest livelihood. There are several universities in Halifax, most with longstanding religious affiliations. Saint Mary’s (chartered 1841) is the oldest English-speaking Roman Catholic university in Canada. The University of King’s College, formed as an Anglican institution in 1789 at Windsor, moved to Halifax in 1923. Mount Saint Vincent, a university since 1966, was founded in 1873 by the Sisters of Charity as a residential school for young ladies and received degree-granting status in 1925. Dalhousie was founded with no religious affiliation in 1818. In 2006 the University surpassed 100,000 graduates, and recently amalgamated with the Nova Scotia Agricultural College, which is now Dalhousie’s Faculty of Agriculture. The Nova Scotia College of Art and Design	was founded in 1925 and later became the first degree-granting art school in Canada. The Nova Scotia Community College offers specialized programs through institutes like the Nautical Institute, the School of Fisheries and the Aviation Institute. Amateur rather than professional sports characterize Halifax’s recreation scene. Yachting, rowing, canoeing, curling, swimming and several other sports have produced national champions. Lake Banook in Dartmouth and the Banook Canoe Club have hosted international canoeing championships, and the downtown Metro Centre has seen national university basketball and volleyball championships. In 2007 Halifax competed to host the 2014 Commonwealth Games, but dropped out of the race, saying that the cost of the event would be too high. However, the city hosted the 2011 Canada Winter Games, a two week event that included 2,700 athletes from 800 communities. Suggested Reading M.J. Bird, The Town That Died (1962); Phyllis Blakeley, Glimpses of Halifax (1973); Donald H. Clairmont and Dennis William Magill, Africville: The Life and Death of a Canadian Black Community (1974); E.R. Forbes and D.A. Muise, eds, The Atlantic Provinces in Confederation (1993); Hugh MacLennan, Barometer Rising (1941); William Naftel, Halifax at War: Searchlights, Squadrons and Submarines 1939-1945 (2008); Simone Poliandri, First Nations, Identity, and Reserve Life: The Mi’kmaq of Nova Scotia (2011); Stephen Poole, Halifax: Discovering Its Heritage (2012); Thomas Raddall, Halifax: Warden of the North (1948, rev 1971). Canadian Museum of Immigration at Pier 21The website Pier 21 in Halifax, formerly the primary point of entry for immigration to Canada. Check out the extensive collection of lesson plans, virtual exhibits, and much more. AfricvillePeople, places, and events in the storied history of the Nova Scotia community of Africville. From the Africville Genealogy Society. Halifax Regional MunicipalityOfficial site for the Halifax Regional Municipality. Provides news and information for residents and visitors.